There is new breakthrough technology that is reshaping the robotic world in terms of robots that teach each other to grasp everyday objects and learn different environments. They are using the cloud to upload data that the robots are learning so other robots can gain the same information. Researchers are calling it the “Robo-Internet” and they feel it will reshape the robotic world as we know it today. 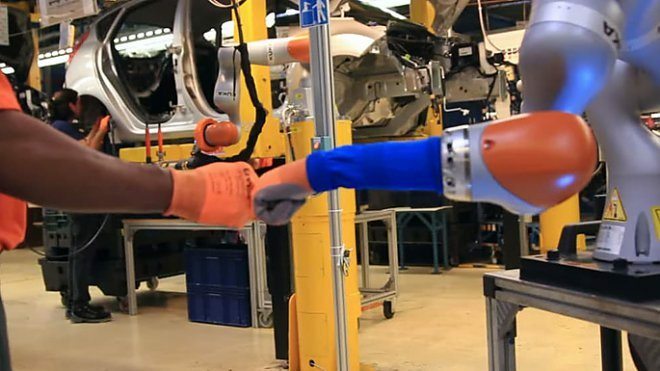 Most robots are programmed to be able to do one job and allowing them the ability to learn from other robots will bring to them other skill sets to be able to perform in unstructured environments such as homes and health care facilities. The robots scan and rescan everyday objects such as hairbrushes and water bottles and learn how to pick up the objects and maneuver them around. They also learn the layouts and designs of new environments that help them maneuver through without hitting objects and people. The Robo-internet is a collective database of web apps that is used for robotic knowledge base where other robots in different locations can enter to gain knowledge from other robots. RoboEarth is one example of a cloud-based platform in which robots learn about different environments from other robots. These scientists have created a cloud-based database where robots teach each other how to learn new skills and be able to perform new jobs without ever having done it before. One robot moves around a new environment scanning the entirety of the space and uploads it to RoboEarth where another robot can ping it at any time to learn what the first robot shared. The Million Object Challenge is based on Stefanie Tellex’s research out of Brown University where she is using her robot named Baxter to learn how to pick up everyday objects and teach other robots how to be useful in everyday life. For robots to learn it takes extreme repetition so pushing their learned behavior throughout other labs that have robots learning the same concepts saves time and money. Tellex states that there are over three hundred different “Baxter’s” around the world in different labs and they are collectively learning together to be more useful in everyday life. They share coded information online through researcher driven mathematical data that is created using the robots infrared sensors on their bodies and cameras on their arms that scan different objects to learn how to grasp them and pick them up. Robotics today is growing by leaps and bounds because of the ability that is gained through the use of the internet and the sharing of information that is gained through its use. Robots teach each other via uploaded information to the cloud where other robots can gain the same learned data without ever doing the actual task before. This gives a great boost to researchers who can share with each other what they have learned and collectively propel their robotic knowledge into the future.